The Modesto architecture tour guides cover several areas of the city. 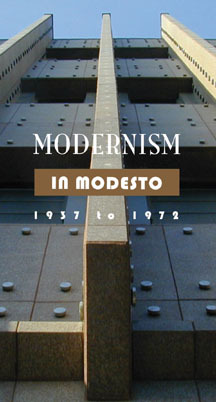 Modernism in Modesto 1937-1972 features modernist buildings mostly in the downtown area. Architectural Pathways will help you explore the Graceada Park area. Modesto Modernism Movie Guide goes with the award winning movie Modesto Modernism. Modesto Modernism Tour Guide is a biking or driving tour over several neighborhoods. The two Historypin tours cover most of downtown beginning in the 19th century.